If God gave up his Son to save us, what would he not give up to bless us and keep us! That's Paul's point. In 1 Corinthians 6:19-20, he tells us we are bought with a price to encourage us toward holiness. 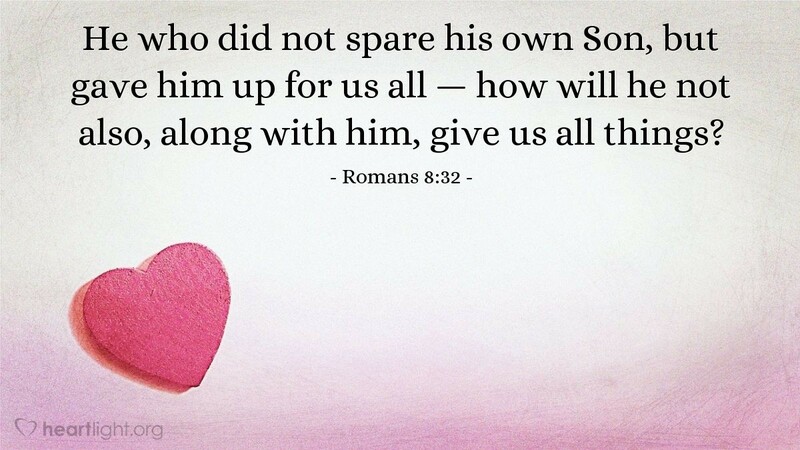 Here, he makes the same point, but to give us assurance. Isn't it amazing how the truth of God's grace contains such a multifaceted blessing. Almighty God, I am overwhelmed at your sacrificial love offered to me in Jesus. Father, please use your Spirit to stir me to service in response to your grace and have this Comforter build my assurance in your salvation and in your longing to give me your rich blessings. In Jesus' glorious name I pray. Amen.